Shopping for Prometheus Action Figures? Looks like some Engineer lost his head! Series 2 set contains David the android and the proto-xenomorph Deacon. Action figures from the hit sci-fi movie Prometheus. David comes with a removable helmet and Deacon includes Hammerpede accessories! Android and proto-xenomorph - cool! 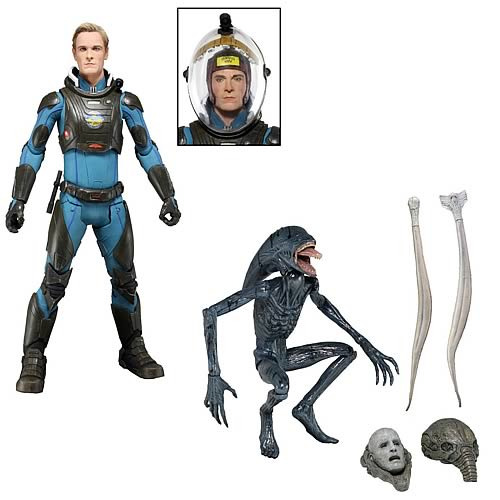 Michael Fassbender's android character David and the creature known as the Deacon from director Ridley Scott's sci-fi movie Prometheus make their action figure debut in this Prometheus Series 2 Action Figure Set! David stands about 6 3/4-inches tall and features over 20 points of articulation. The android action figure includes interchangeable heads and a removable helmet. The proto-xenomorph Deacon is fully poseable and packed with bendable Hammerpede accessories and a dissected Engineer head! Both are contained in collector-friendly clamshell packaging. Ages 17 and up.